Hi guys! I was going to begin this with a rant on my blog going a bit haywire recently in the technical department, but I'm here typing and I'm not going to waste time on that! I just want to tell you about some clothes, as per usual for the last eight years! And in those years I generally don't review things as my blog is more of a diary than a style guide, but I checked out an email from iKrush.com and said ohhh hello to their co-ord category. Co-ordinating outfits ar rife on the high street right now but they are often with shorts, and shorts might be the least wearable clothing item ever. I hovered over the super sweet trouser sets before ordering these tropical trousers to try for my twist on a co-ord: a mis-co-ord! Mis-matching prints can add something a little more unexpected and I had these in mind for work too with an oversized shirt, smart sandals and a slick yet huge top knot. I have a one track mind when it comes to fabrics and these are more soft than sheeny, and do not crease. I spend my life trying to find trousers that do not crease!!! And seriously how pretty is the Topshop tropical bralet. I made a beeline when it was restocked and at £20, I feel like putting it in a frame. As a member of the pale, fair skinned club, I have foundation woes all the time! I generally do a light tan if I'm going to bare my limbs at the weekend, and I would welcome a Sally Hansen-style skin foundation in my milky shade, but a light coat of fake tan usually does the job to give a more even skin tone on my legs, cover any bruises or veins, and feel a little exotic. I like to either be definitely tanned or 100% not, as the in-between patchy stage is just rough! I don't tan my face so across the week it means my body is various shades and I need to warm up my face to avoid looking ghostly from the neck up in comparison. 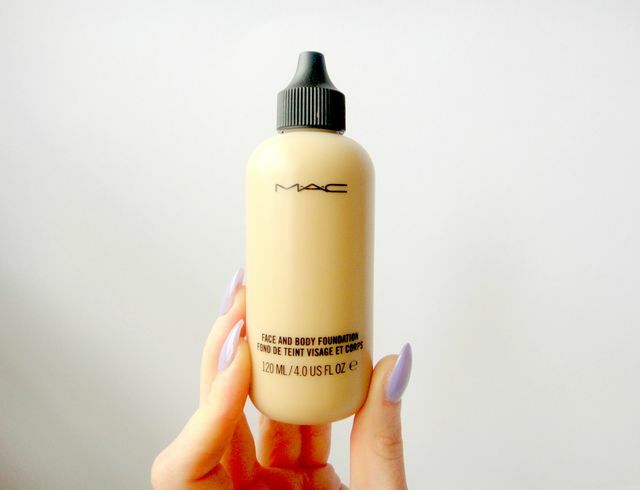 If you've ever tried wearing a foundation that isn't your colour, you will know that in a number of hours, it naturally fades or wears off in certain areas and leaves that not-so-hot patchy complexion. I'll pile on the primer and powder for a night out, but on your standard Tuesday, I don't want to look various shades of orange! So I racked my brains for a past foundation that worked for my pale days and faux tanned days. I'm a fan of good coverage but that means you have to take your unnatural shade right down your neck and up to your ears, and for day time it's just too much. I needed a product that gave a wash of pigmented colour for those in-between days that wasn't too heavy. Light foundations with good colour pay-offs are hard to come by and I remembered when I had Face and Body, way back when. I believe this was one of my first MAC purchases when I went to an awards ceremony in London in the early days of this blog and I had a MAC makeover. 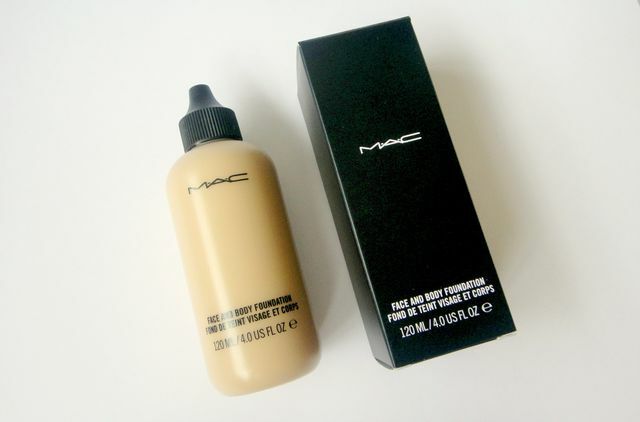 Face and Body dribbles like water; it's so smooth and liquid, but it has that deep colour payoff that MAC products offer. When you first apply it in long sweeping motions, the formula glides over every contour without drying out on the brush and it feels almost tacky; the feeling like when you apply fake tan and have to wait for it to dry. A few moments later, the benefits are a definite colour pay off, rather than mattifying or masking your skin. In the day time I don't really have the time or need to be wearing anything heavier that then warrants contouring and highlighting. I don't mind being any skin tone as long as it's even, and that's the aim here! I went to the stand-alone MAC store in Birmingham, which has an MUA I really like, but I generally prefer the Selfridges counter, which is now HUGE and also has an MUA friend! I assumed the large Face and Body bottles were only available at the store though, but due to the poor lighting I couldn't tell which shade to get! It's so hard to choose a tone different to your own, and communicate that you want a colour for when you are slightly tanned. I ended up with C3, which is deeper than my skin tone but for reference, I used to wear C2 for nights out at uni when I didn't wear tan. Face and Body is perfect to add to legs and arms, which I would do with a lighter shade if I didn't fear it rubbing off on light clothing, and I would want to cover my entire legs! But for daytime it's the perfect light-coverage-but-full-pigment shade that I need as my tan is being scrubbed away as fast as possible. Now I'm slightly blonde (ahhh!) I'm embracing the pale skin even more though... watch this space! If you are pale skinned, do you know a way to help out legs and arms without tanning? I'm lusting after Iggy Azelia's perfect paleness! I have been having some obsessive thoughts recently and they involve going blonde. Argh! Not platinum blonde but I think I'm ready to become more strawberry blonde than bright red anymore. Have you fainted in shock?! I know! I know. So blonde. Yes I'm really writing this. Basically I'm a bit tired of my red hair. I went red first way back in 2011 when I had a complimentary hair experience at a salon and it came out darker than my Amy Childs-esque request, but it was my first foray into hair dye. I remember a time when I hair modelled and had 'virgin' hair, aka never-dyed hair; the gold for all hairdressers! The colour faded out nicely and subtly over time and I was back to my original ginger within six months. I personally hadn't had many bad experiences of being ginger until I was more like 16/17 and dressed quite alternatively for 2005, and that's when I started this blog! Yes I have been blogger for over eight years... anyway, enough shocks for one post! So throughout uni I was confident enough with my hair but in my final year I did experiment with richer tints, just to add some depth. The element of my lighter red hair that I wasn't keen on was that it's hard to wear colour with bright copper hues, and I just wanted to break free from the look I'd had all my life. 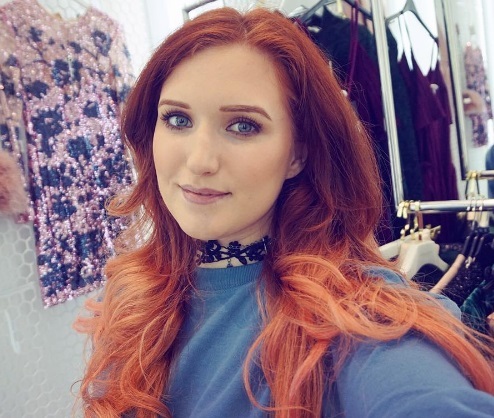 I've just had a dusty dig through some very old blog posts to source this photo of my natural colour and my God, I wish it was five years ago! Not in comparison to my current life but for the fact that things were so much more simple back then. The only social network you bothered with was Facebook and I didn't feel like I needed a fancy camera to blog. Oh to be a student again! 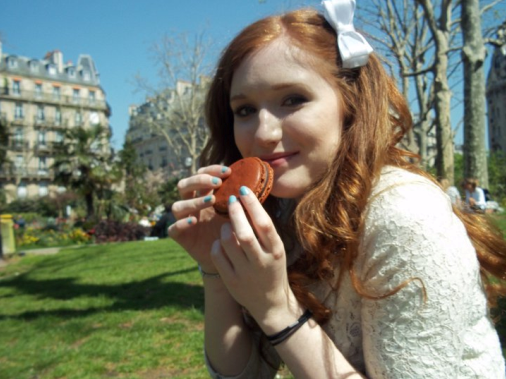 Fast forward to May 2012, around eight months after my first bright red salon dye, and I picked out my first box dye. I had experimented with vegetable dyes in uni that left a nice tint, but the pillar box red, off-the-shelf dyes give that bright shock of red. Cheryl Cole was red, Rihanna was red, it had to be done! I had heard SO many times that red fades and washes out so quickly, so permanent dyes were a habit right away, when in fact the dyes never seemed to fade. Over the past two years, the only challenge has been doing my roots every month or so, and then sometimes coating the rest of my hair for 10 mins for a colour top-up. Unfortunately the multiple root applications of harsh permanent dyes meant I've been re-dying the top section of my hair constantly, so have colour build-up for most of the top half as it has grown for two years. When I worked in fashion, a vibrant look was perfect for an 'absolutely anything goes' dress code, but now that I work in a more professional setting, my hair just feels too brash and dark. At Motel I wore crop tops and short hemlines all the time, but they are most definitely a no-no now, so there's no point in me using fake tan every week. I find a tan helps balance my darker hair, but it's just a waste of time and money if I'm covered up constantly! I'm also a little bored of the same style I've had for two years, and hope to look a little more professional at work. I'm still battling the fact I can look about 21 and fresh out of uni, rather than a person with three years in the biz, after a four year degree. So here I am, contemplating going lighter. 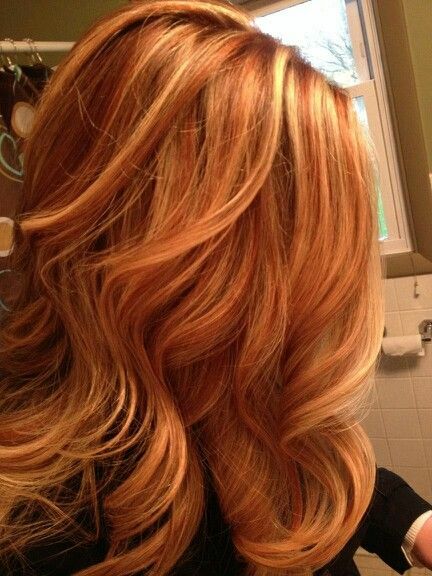 I'm hoping to travel back to my original colour and then almost pass to the other side of strawberry blonde. Looking at fellow redheads like Jessica Chastain, Isla Fisher and Nicola Roberts, a warm blonde is a smooth transition and still suits the pale skin/light eyes colouring. 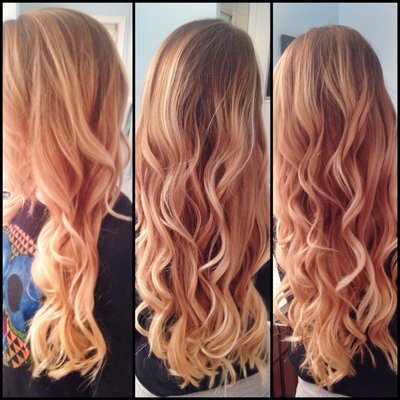 I'd almost like a pink/peach blonde too, ready for summer. Here is my recent inspiration from favourite Instagrams @sarahashouri and @janebelfry and some snaps from Pinterest. Are you feeling where I'm wanting to go? The only issue is, I wasn't sure if a hairdresser will! I've visited three top salons so far and had three different consultations. If I get an idea in my mind, I don't wait around. You only live once! The first salon is my usual hairdressers and they let me know that I had colour build up and it may go brown before it goes lighter. They said they would try a light lift and then a stronger lift of colour, then a base colour with highlights. It was suggested I started washing my hair with washing-up liquid, washing powder, and Head and Shoulders on dry hair, which I have been doing bizarrely this week! They also took a strand test but I haven't heard from them yet. The second salon looked very dubious, said they liked the red anyway and suggested I would have to go brown. I said I'm afraid I'm just not a brunette! They also did a strand test but called me a few hours later saying the colour had lifted and they were happy to go ahead but it would be expensive. The hesitation in the answer machine message was enough to tell me they were not confident. Onto the last consultation, where I was starting to deliberate if I should stay red but try to brighten it up, as now it is quite dark. They again said they weren't sure which colour it would go and said it may go pink, and I may have to revisit to reach my desired colour. There was no strand test here though and the price was reasonable for a colour-specialist salon, and they went straight in with the strong lift so no cost for a light lift. HMM what should I do! My thinking is that I can always dye it back to red easy peasy, so it's not a detrimental change. I don't want to try the ColourB4 treatments as I know my hair will come out very patchy, and I'm in no way skilled with dying or treatments. I'm going to book a week off work in May and I might just go for it. No hairdresser guaranteed they would reach the colour I want in the first session, which makes me dubious at agreeing to pay for something that might not be what I want, but I can't be this red forever so it's a long time coming anyway... What do you think?